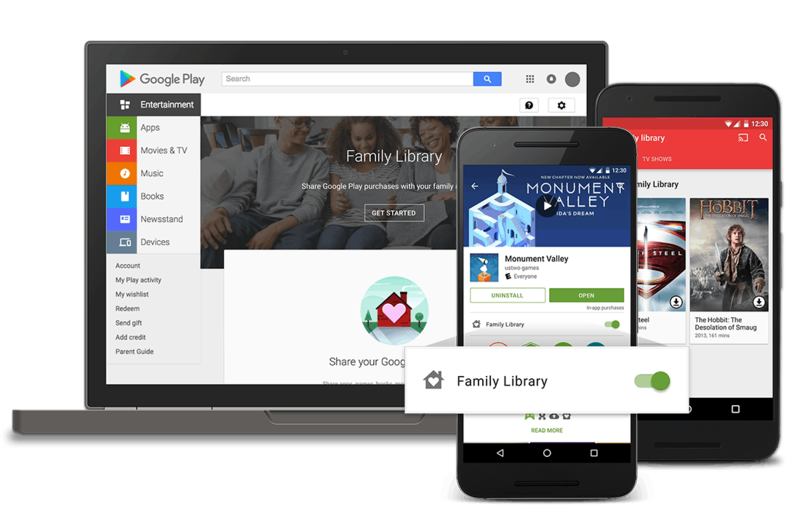 Google formally announced the launch of its family library sharing plan today, showing that early reports of Google Play Family Library's flawed design were greatly exaggerated. Google announced on its official blog on Wednesday that users in Australia, Brazil, Canada, France, Germany, Ireland, Italy, Japan, Mexico, New Zealand, the UK, and the US will shortly be able to set up a family account and share content. The service first launched last year, but could only be accessed by paying for a Google Music subscription from inside the Google Play Android app. Now we're going to be able to set it up via the Google Play website. Or at least that is what reports claim; it's not available to me. And according to the FAQ page, the family library is supposed to be available through Google Play Android app. That isn't working for me; how about you? When you buy an eligible app, game, movie, TV show, or book in the Play Store, you can now share it with your family—across devices—with no additional sign-up fee. Is that how it's working for you? It’s not working for me “yet” and I suspect it never will. Google have a history of shutting out people like me with legacy “apps for domains” accounts (and any other apps accounts which may be paid for). I signed up for free years ago and now all my stuff is tied to my account which is tied to my apps email address. My oogle experience is limited because of this policy and I’m almost certain that I won’t be able to sign up for the family system. I’ve tried to sign up for the family music plan and it’s not an option. I would probably pay a modest amount (I’m already paying for storage) for a system where I can have an email address with my own domain but still have access to all the goodies that regular gmail users have access to. I have neither of these Google.